What Is It? : A nonprofit that feeds 800,000 hungry people each year by distributing food through nearly 600 hunger relief agencies in 18 southeast Texas counties. Help Needed: Projects include sorting and packaging food, preparing meals, helping provide school supplies to teachers, organizing food drives, posting on social media, and helping with special events. Minimum Age to Volunteer: Minimum age to volunteer: Children as young as age 6 are welcome for many projects. Volunteers under age 17 must be accompanied by an adult parent or guardian while volunteering. Volunteer projects vary based on need, and may include inspecting/sorting food, repacking dry food into family-sized bags, stocking or cleaning the Emergency Food Pantry, or one of many other opportunities. Volunteers may help prepare and package nutritious hot meals or help sanitize the kitchen. Ages 16 and up; 16-year-olds MUST be accompanied by parent or guardian. A 16-week program for high school students ages 16-18. Students get training and experience while taking a leadership role in volunteer-based projects. Completion of the program is a step toward becoming a member of the Apple Corps, a dedicated group of volunteer leaders at the Houston Food Bank. More information is here. Other programs include distributing food at community food fairs, community centers, or elementary schools, or helping with one of the Food Bank’s many special events, such as Empty Bowls Houston, Canstruction, or the Souper Bowl of Caring. This program provides school supplies to teachers who work in low income areas. During weekday shifts, volunteers help stock and organize items on the shelves, and prepare for teacher pick-ups. On the weekend shift, volunteers help check customers in and out, assist them with shopping, and stock and organize school supplies. Ages 13 and up. Help spread awareness of the Food Bank’s activities by posting at least twice a month on any of your social media channels – Facebook, Twitter, LinkedIn, Tumblr, Instagram, or even a simple blog post. 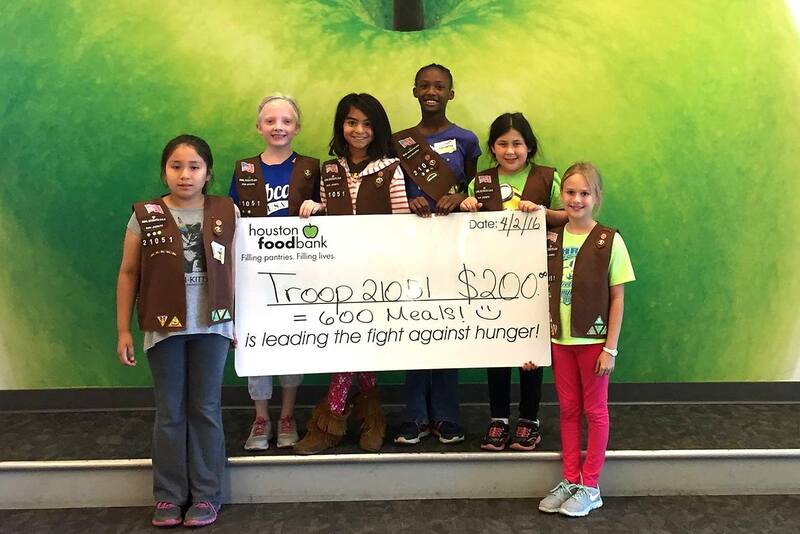 Ambassadors also share Houston Food Bank posts and tag the Food Bank in their posts. Each year, for a week in early December, shifts of volunteers help Food Bank staff register clients by phone to receive holiday food boxes. This work helps tens of thousands of people access the food they need over the holidays. Volunteers receive plenty of instruction and support, and receive an average of 50 calls per 4-hour shift. Spanish speakers are especially needed. Minimum age for phone volunteers is 16. For more information, contact Rocio Rubio (below). Varies, but shifts are typically 3 or 4 hours long. None; the Food Bank will provide instructions. Held food drives; held a low-carb food drive for Food Bank clients with diabetes; assembled two ventilated, lockable security racks for winter jackets to be used by volunteers in the freezer section, stocked these racks with winter jackets, and assembled more than over 2000 toothbrush and toothpaste sets for the Backpack Buddy Program. The warehouse is located at 535 Portwall Street. Volunteers also serve at the Food Bank’s Keegan Kitchen, 2445 North Freeway Houston, Texas 77009. I have ADD and volunteering here was soo satisfying. We packed enough food to hypothetically last someone 76 years. I really enjoyed volunteering here. My daughter volunteered here when she was 6. It is one of the few places in Houston where kids as young as 6 years old can volunteer and do something “hands on”. The Food Bank’s volunteer programs are extremely well run. I volunteered at the Food Bank right after Hurricane Harvey in an effort to help distribute food throughout the city to people in need. The experience was amazing. Despite the overwhelmingly large amount of volunteers, they took in every single one of us and had a job for us. It was really hands-on and fun to do! It’s also pretty relaxing, so you can come and do it with your friends and have a great time. It was amazing to see how much food we had packed, and I felt like we did something really beneficial. I will definitely do it again. When does this opportunity start / end? What do I need to submit to begin the opportunity? The Houston Food Bank offers many different volunteer options, and times vary. Please visit this link or call the Volunteer Hotline at 713-547-8604 for more information.